From the Appalachians to the Atlantic, South Carolina’s awe-inspiring beauty is revealed in this visually stirring and heart-warming tribute to one of America’s favorite vacation destinations. 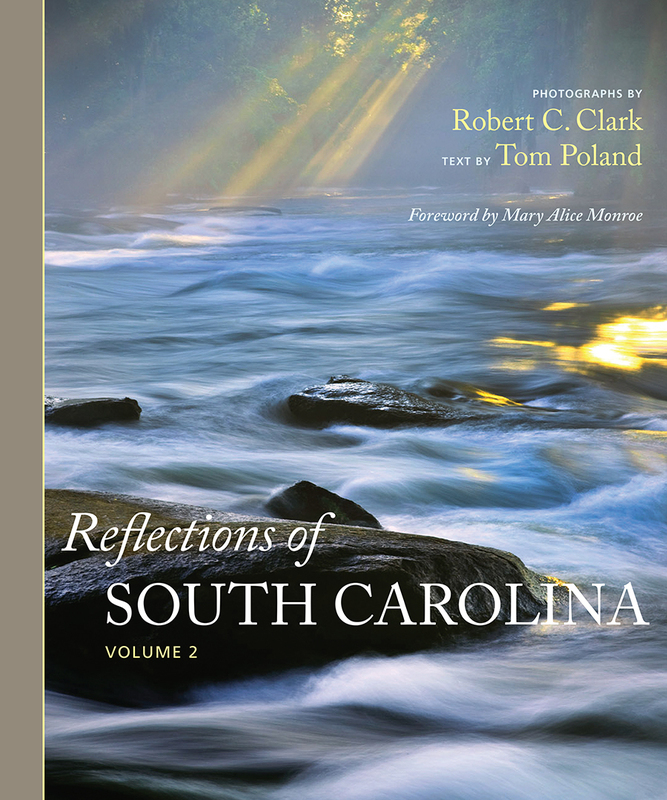 Rich with 250 stunning photographs, this second volume of Reflections of South Carolina uncovers the geological, natural, and cultural grandeur the Palmetto State packs into 32,000 square miles. A foreword by New York Times best-selling author Mary Alice Monroe complements the photographs and text. In working on Reflections of South Carolina, Vol. 2, Robert Clark and I traveled South Carolina from the mountains to the sea and beyond. From Upstate, across the Heartland, and all the way to the islands we documented those things we found interesting. There’s much to discover in this land of blue streams, sea dreams, and moonbeams. Reflections of South Carolina, Volume 2 documents the state’s surprising variety as well. You can stand atop Sassafras Mountain in August and yet feel fall’s chill or walk Charleston’s cobblestone streets in shorts in the middle of February. Clark and Poland advise visitors and residents alike to take their time exploring South Carolina and whenever possible to take the road less traveled—for the next turn might reveal an antebellum-era slave chapel, a farmer peddling honey and tomatoes, a mountain’s reflection in a sparkling lake, or a peach orchard exploding pink. What could be next? A praise house? An unforgettable character? Art on an abandoned boat? Discovery makes a great companion. “This is essential reading for all South Carolinians. Reflections of South Carolina is a gorgeous tour of our state’s endless treasured landscape. The words of Tom Poland and the photographs by Robert Clark will thrill you. It’s that good.”—Dorothea Benton Frank, New York Times best-selling author of ten novels. Authors’ Statement—We looked for the South Carolina past and present we knew was out there. We found ruins, witnessed nature at her best, saw captivating work by artisans and artists, felt the hand of history, and stumbled upon astonishing sights. We came; we saw, we documented. We captured much of this land’s magnificence and hereby present it to you. We leave this record for readers who make the journey in years to come, but for now we bring you Reflections of South Carolina, Volume Two. Start out Upstate. End at the coast. You’ll like the journey.